The Kindle Books in our NHDB collection are yours for two weeks, but what if you are a fast reader and want to return the book early? You are in luck! The Kindle Books can easily be returned back to the collection. You'll need to use the Amazon site to do the returns. 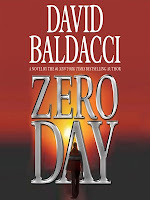 Log into your Amazon/Kindle account. If you don't see a "Manage Your Kindle" link right away, visit your account. Find the section on "Digital Content" and click on "Manage Your Content and Devices." From the "Manage Your Kindle" area, find the desired title. Place your mouse over the "Actions" button. 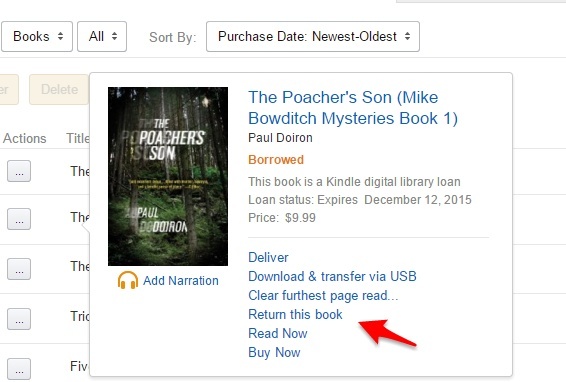 Click on "Return this book." Allow the page to reload. The title will still appear in your account, but it can be removed: Actions >> Delete from library. Learn how to remove expired titles from your Kindle. 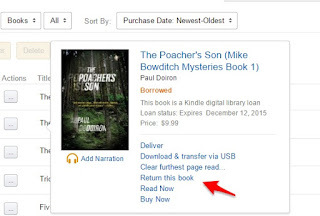 Learn how to immediately return a Kindle Book checked out by mistake.